Another week is over, and I must say that previous week was quite active. I'm saying that just because all DavidNews.com monitor programs are continually paying as they paid before and they are bringing consistent profits for all readers. Also, as usually HYIP industry is growing, and that is good news for all readers here, but for now - weekly summary. Venround - Well made Golden Stage project running on H-script. The project was reviewed during the previous week, read the review here. Forex King - A standard listing project that was reviewed on Sunday. I was not covering much in the review, but I'm sure that project will be with us for some quality time. StartupInsider - A Very hot project that for now is one of the most popular projects around. To be honest, I think that it is getting too popular, and maybe it is would be wise to hold on to your investments here. POKERIRON - Another poker related project, but this time, it is not a low-return project, but a project that offers sweet returns. More you will find on the review what will be published here on DavidNews.com during this working week. 12Daily Coin - "Piggy bank" project that pays hourly instead of daily and I'm sure many investors will love that. Also, this project will be reviewed later this week. Secret Place - Automatic Bitcoin game that accepts just Bitcoin payments. Here within 40 days you will be able to double your Bitcoin investment. Orient Organization - The project is not fresh, but this project is online already for almost 50 days and has proven to everyone that administrator is not a rookie, and he knows how to manage things. Investment plans find on monitor section. WINEDAY - A Classical after-one-day project that offers you starting from 2.5% pure profit within 24 hours. Also, this project will be reviewed in the second part of this week. This project is one of the most interesting HYIP projects that you can find in HYIP industry at this moment. The project pays stable 5% daily for 31 business days, and I see that people like this project more and more. If you are interested in some additional details about this project, please check the review here. To better adapt to the requirements of our European customers, our website is now translated into French language. Through our international staff, we offer a personalized and attentive customer service. Therefore, do not hesitate to contact us for curiosity or for any kind of questions you might have: we are always listening and ready to help you! Satisfying our customers is the most important mission for us. Great news for Italian users! Our website is now translated into Italian language. Yes, we are young, but we are growing stronger everyday because you have shown your commitment to ensure our continued success. You will soon see that Amazing5 is not just another fly-by-night investment company that is here today and gone tomorrow but an established and secure place to invest your funds! The next step will be to expand our services to Asian users and to translate our website into all the Asian languages as well. Within previous week administration added two new languages - French and Italian. Additionally, I'm happy that project now will also be targeting Asian languages as well because even if there are not that much HYIP players these days, I'm sure that in the future Asia could be one of the biggest regions where HYIP players come from (just because of the population in Asia). This project is a quite standard one (although administrator have listed this project at Golden Stage position), but I see that people are investing in this project quite a lot just because it pays hourly and you can withdraw your initial deposit anytime when you want. Who register today until january 30, 2016. Will be get 1 million satoshi Startup bonus. Tell your friend and register now. Today it already 1 Week as 12Daily Coin Limited. work with you all together and for us it is a big pleasure to achieve something really special in this life and without our investors it would be impossible! Alexa global rank 255,480 , total registered investors 4344 and more then 3700 BTC invested! In nearest time 12Daily Coin Limited. waiting for sharp rise of all our main indicators of development and stability of 12Daily Coin Limited. There are coming new upgrades that will be available for you all! Please invite all your friends, support on forums, vote on all monitors and promote the project in the social media and in any place that you can. Let the excitement begin! Cheers! At previous week administration announced that for every registration they will give 1 million Bitcoin "satoshi" bonus (smallest part of Bitcoin). After short time administration announced that they have reduced this bonus to 10000 "satoshi". There was another news this week, and administration published some statistics where only Alexa rank in my mind was only real information. This project is one of the most professionally managed short-term HYIPs that you can find right now in HYIP industry. The administration does not offer investment plans, but you can purchase shares that bring profit after a shorter or longer period. Is excellent news for users of Perfect Money! Today we have finished the testing and setting of yet another payment gateway, and now it's available for you to refill your balance and withdraw profits through Perfect Money. A large number of fans of this payment system will certainly appreciate the next stage of our development! Administration during this time published three newsletters and in first one administration informed about video presentation of this project. On second newsletter administration reported that finally project added Perfect Money as payment processor that inevitably will bring new investors into this project. Final newsletter announced winners of the contest. Well made project that clearly have all the right ingredients to grow big. Of course, for now, it is too fresh to predict if it will grow big or not, but in any case, it is worth to observe and maybe to invest some smaller or larger amount. How to do that: make a short video, in which you share impressions about our project, providing examples of the actual investments you've made. Upload the video to a video hosting and send a link to us via Contact form. The money will be credited to your deposit. Alternatively, it can be received via any supported payment system. The administration announced some competition where you could get $3 bonus for shared video that helps to share this project to new investors. 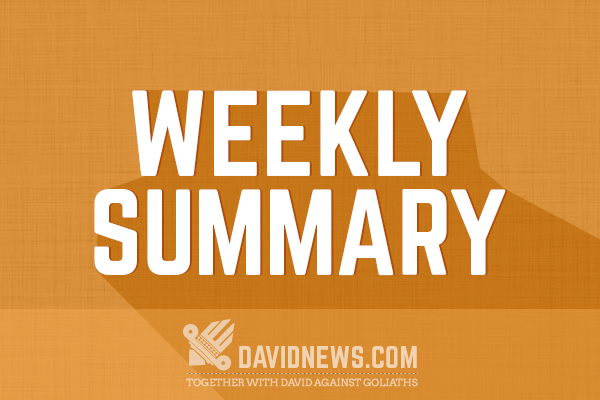 This is all this week, and I again apologize that I posted this weekly summary later than usually because of some personal problems. Anyway - DavidNews.com is back on track and will keep you posted on what is going on in this industry. Also, if you have anything to say remember to post your thoughts on DavidNews.com chatbox. Have a successful week and see you around! I would recommend that you pick the most recommended Forex broker: AvaTrade. Generate free bitcoins from DailyFreeBits. Up to 1,000 sat. every 60 mins. If you're looking to buy bitcoins online, PAXFUL is the ultimate source for bitcoins as it allows buying bitcoins by 100's of payment methods, such as MoneyGram, Western Union, PayPal, Credit Cards and even exchanging your gift cards for bitcoins.